I didn’t know what to do with all the sorts of quality cotton leftovers I had at home. I’m sure many of us, crocheters, have the same problem. 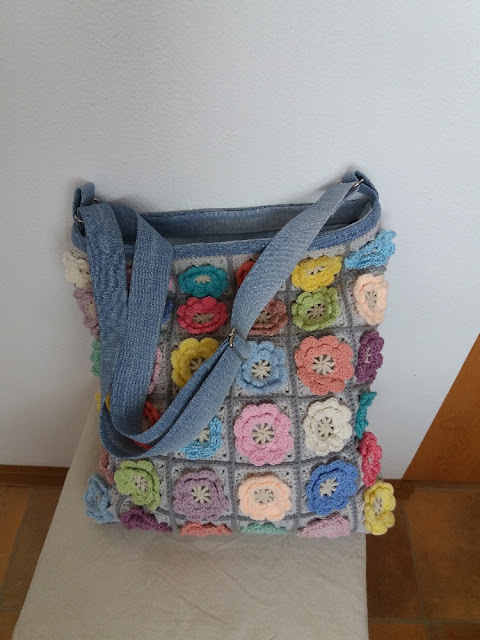 Since I really love to make bags and purses, I decided to combine the leftover cotton with denim and try to make some bags bigger and smaller. For the denim parts I used jeans (preferably not stretchy) from charity store. I understand it may look difficult at first, but I only have minimal sewing skills and I –with some help from Google –managed it. So don’t be scared. Google up how to sew simple bags (there are so many good tutorials on Pinterest for free) and go for it. 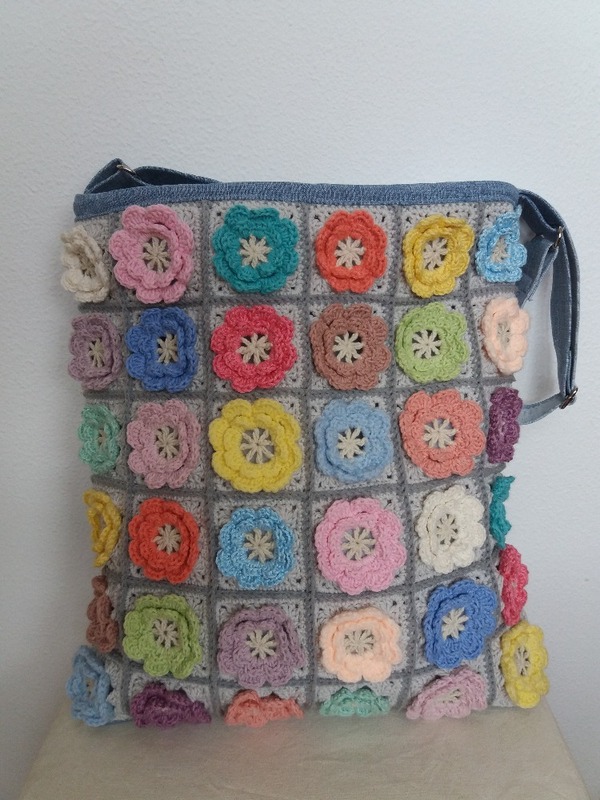 I have to admit sewing the first bag took me around nine hours, the second one was ‘’only five hours’’. I know a professional tailor would be probably be crying at the time I used and the fiddling around I did. But I’m very pleasantly surprised with the outcome. The sewing is not absolutely perfect, but it looks clean and professional enough for me. 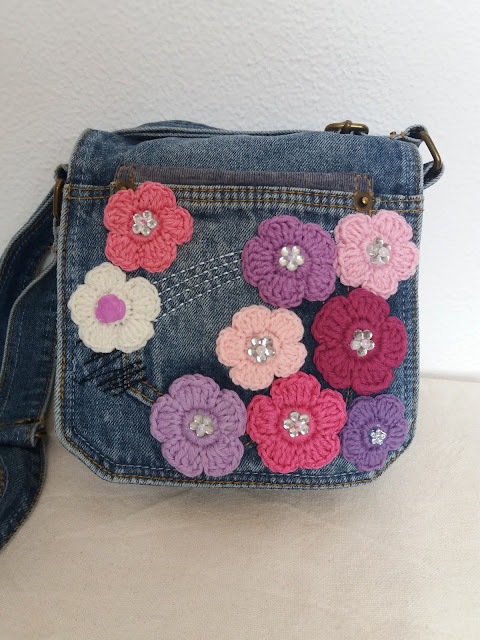 The only advice I can give you is to make the front/flower part first. 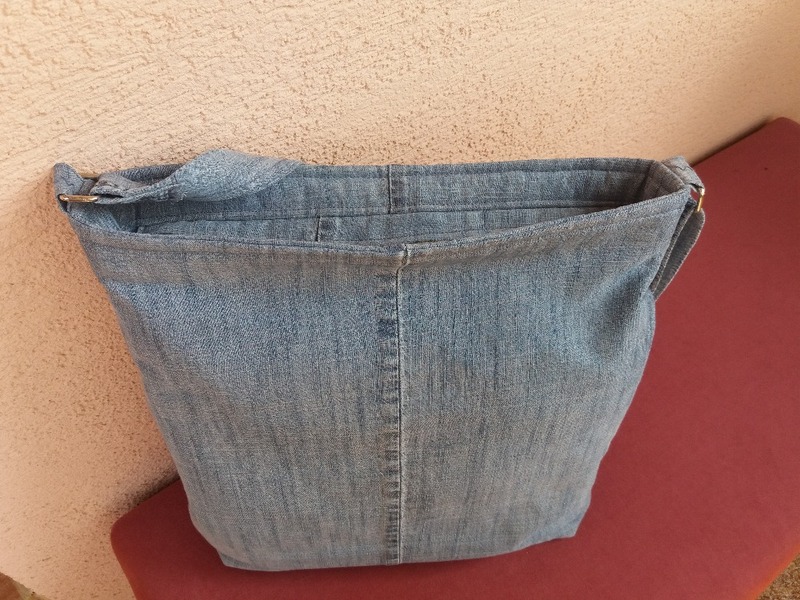 That way you can adjust size of the denim parts easily. The smaller bag you can see right below is measuring: cca 37cm x 36cm(14,8” x 14,4”). 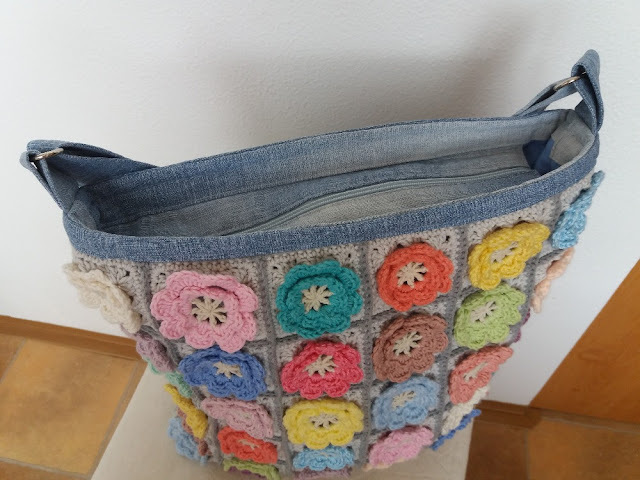 The bigger bag you can see further below is measuring: cca 39cm x 41cm(15,6” x 16,4”). 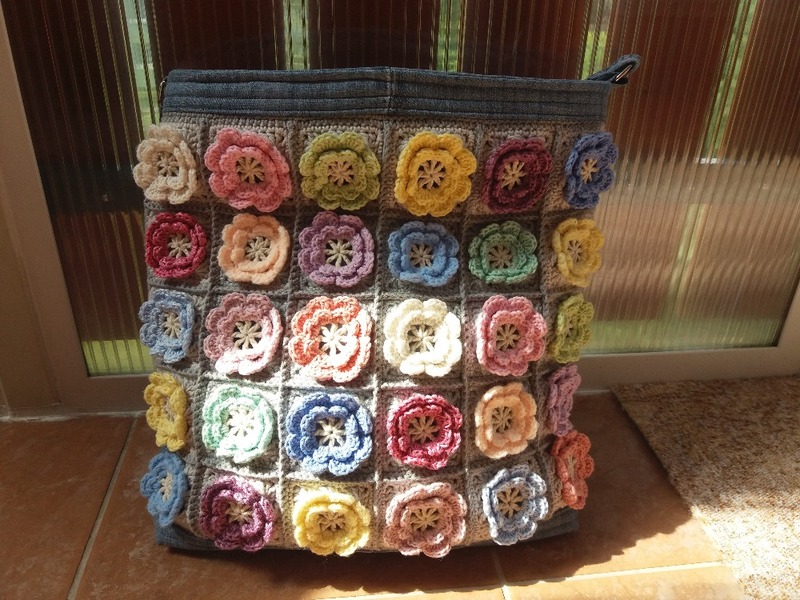 First you have to make flower squares (30 for small one, 36 for the bigger one). One square is cca 6cm x 6cm (2,4” x 2,4”) if you work with crochet hook G/4mm. 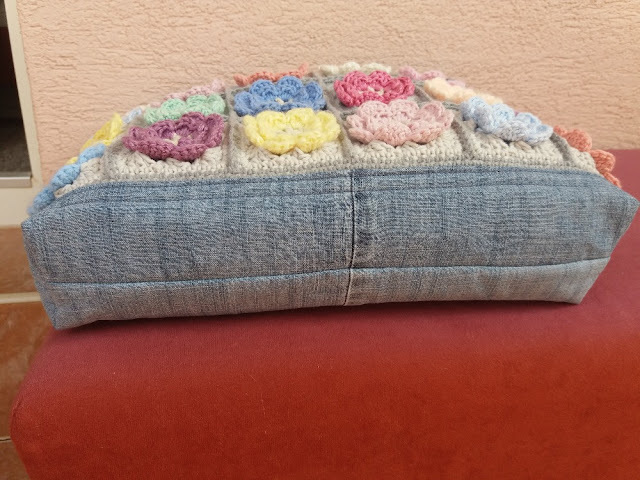 You can use any flower square as long as you like it. It is your choice. You need to crochet the squares together, I used sc’s. 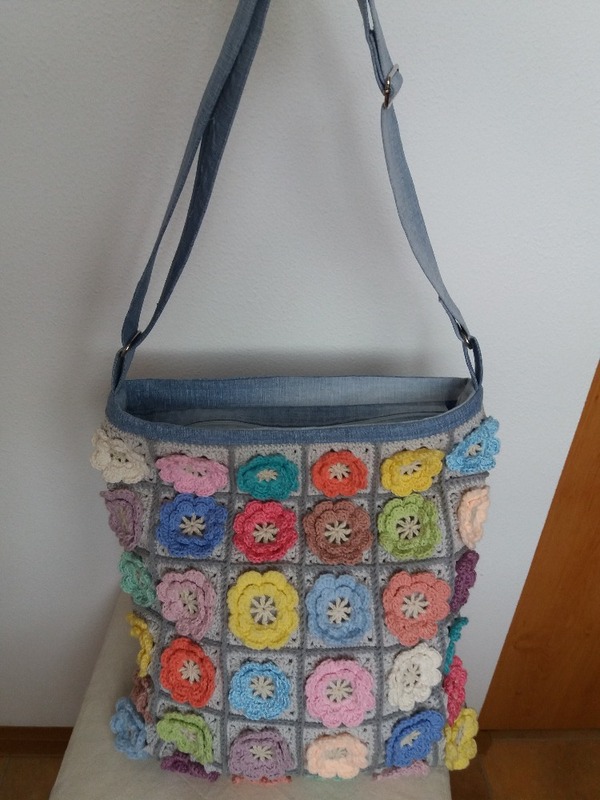 You should have the front crocheted before you start with the sewing. Now sew the back using this crocheted part as a front side. 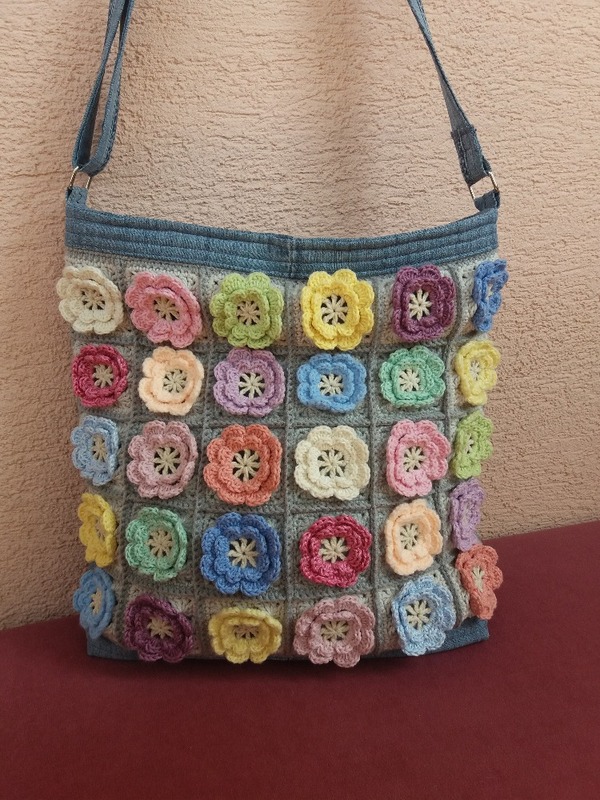 It is great way to use leftovers and recycled jeans to make a beautiful and eye-catching bag. Color combinations are endless and the price of materials very moderate. I just hope I will get faster with sewing, but they say practice makes perfect. I most certainly hope so because I have got so many ideas for new bag designs. 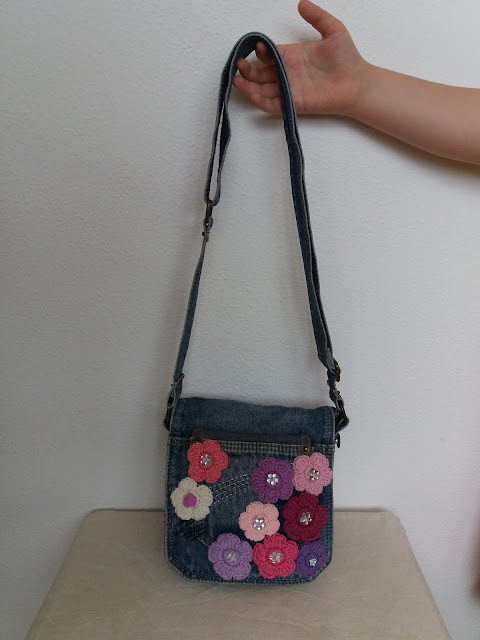 My little daughter “desperately needed” a new bag. Which girl doesn’t? I found a suitable denim cross body bag in my local charity store. The only problem was it had some not very nice labels and stickers all over it. I just removed them and properly washed the bag. I have all sorts of yarn and cotton leftovers. I used them to make the flowers. My daughter made the choice of colors and beads. And that is what we came up with. I think it looks very cute and the colors are matching to pretty much every shade of pink garment in my daughter wardrobe. I just removed all the unwanted labels from the bag and washed it in the machine. I used a very simple flower I found on the net. I don’t know who came up with the pattern for this flower first. There are so many practically identical free patterns available. Round 1: MR, ch1, 15sc’s into the ring, slst. into first ch1, don’t turn. Round 2: *ch2, 2dc’s in each of next two st,, ch2-slst. into next st.,* repeat 4 times, fasten off. Sew the flowers on the bag the way you would like it or the way you can see it on my bag. 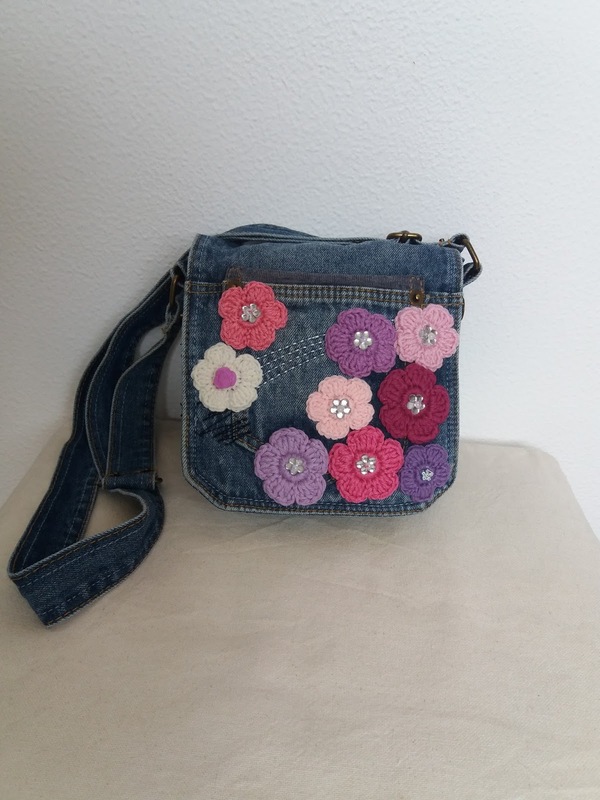 I put a flower button in the center of each flower. There it is. You should have nice bag now or an inspiration for one at least. I hope you understand, but if you come up with any problems or difficulties, write to me, and I’ll be more than happy to help.